Ceuta is a small exclave bordering with Morocco on the northern coast of North Africa. It is included as part of the province of Cadiz in Spain, and can be easily reached either by ferry near Cadiz (which takes about 35 minutes) or a flight from Malaga. More or less divided into two zones, most of the inhabitants to the east are Spanish, whereas if you head west it is more Moroccan. There is also a small population of Jews and Hindus, so quite a wonderful mix of cultures and cuisine. The official language in Ceuta is Spanish, and not only does it benefits from a wonderful Mediterranean climate, but as this is the point where the Mediterranean meets the Atlantic, its beaches and water sports are a huge attraction. Yachts from all over are moored at the Sports Marina, and this is also where you will find a number of diving schools as diving is particularly popular activity. There are several places of interest to visit such as the Cathedral, the Shrine of Nuestra Senora de Africa, the Royal Walls and Fosa de San Felipe. Fosa de San Felipe was a canal built for defence with a strong current running through it. Although originally constructed during the Almohad period, what you see today was the reconstruction done during the 17th century. The medieval Royal Walls are located in the main Plaza de Nuestra and is the most impressive sight in Ceuta. They have been beautifully restored and inside these thick walls is the Museo de los Muralles Reales, a very atmospheric art gallery with temporary exhibits. Also inside the Walls are the original vaults of the old artillery stores, which now form part of the Parador Ceuta (Hotel La Muralla). 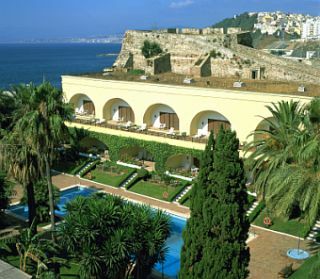 This Luxury modern four-star hotel is the perfect place to base yourself whilst staying in Ceuta. It has panoramic views of the sea and the historic centre, a lovely tropical garden, seasonal swimming pool, and a restaurant which serves a combination of Andalusian and Arabic cuisine. For something different, you must not miss the Casa de Los Dragones. Recently restored as well, this fine example of eclectic design is outstanding with its fabulous balconies and four magnificent dragons springing from the roof. Close to the sea is the Parque Maritimo del Mediterraneo which was designed by Cesar Manrique. It includes a huge pool deck on the sea, a grand lagoon, some salt water pools, and several restaurants and bars. However, not far away is the Seaman’s Village, and that also has a wide range of restaurants if you wish to stop for lunch. Walking around the peninsula itself is a wonderful way to appreciate the history that makes Ceuta what it is today. The Ermita de San Antonio is a 17th century convent which has wonderful views of Europe and Gibraltar. It is also the venue for a huge festival held in June. As you look out over the landscape from here you will start to understand why the large fortress just south of it was built. The Fortaleza de Hacho was originally built by the Byzantines, and later extended by the Moroccans, Portuguese and Spanish. However, today it houses the army so unfortunately it is out of bounds. If you particularly enjoy carnivals and festivals, the best time to visit Ceuta is between February and May, or during the summer months when festivals such as the Sailors Pilgrimage of Virgen del Carmen takes place. Ceuta in itself is a tiny city, so getting around is quite easy on foot or by bike. The downtown area and waterfront is very attractive and has plenty of cafes, bars, and shops. But the Grand Bazaar is the place to go if shopping is on the agenda. Ceuta also has quite a vibrant nightlife, so at the end of a relaxing day there is still plenty to keep you amused in the evenings.